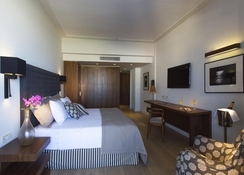 5-star Aquila Atlantis Hotel is an all-inclusive family friendly hotel located within sight of the Heraklion harbour and is barely 400 m from the Archaeological Museum. Featuring an outdoor pool, a semi-covered indoor pool, an elegant restaurant and a great location, the hotel invites guests to have a comfortable stay with all modern amenities and warm hospitality. Tastefully furnished guestrooms at the hotel with parquet floors and earthy colours come with modern amenities such as air conditioning, a flat-screen satellite TV, coffee machine, work desk, a minibar and en-suite baths with bathrobes, free toiletries and slippers. This attractive city and conference hotel enjoys a quiet location just 100 meters from the center of Heraklion, with its numerous shops, restaurants, bars and nightclubs. The sea is about 100 meters away from the hotel building. A public transport stop can be reached in just a few minutes' walk (100 m). The airport of Heráklion is about 4 kilometers and the airport of Chania is about 152 kilometers from the hotel. The archaeological site of Knossos is 5.5 km away. 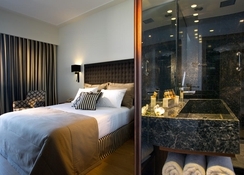 Ariti Grand Hotel Corfu has 156 spacious rooms and suites. These come in various categories like single room, double - triple room mountain/pool view, double - triple room lake view and large family rooms. The rooms offer amenities like air-conditioning, an en-suite private bathroom, satellite TV, direct phone, fridge and balcony with excellent views of the lagoon, garden, town or the woods. The Ariadne restaurant at Aquila Atlantis Hotel is the ideal venue for business lunch, a formal dinner among a refined ambience. Expert chefs prepare delicious local and international cuisine using fresh, local products. The Lounge Bar serves a superb breakfast at morning and drinks later throughout the day and late into the night. Guests can also depend on the friendly room service at the hotel. Aquila Atlantis Hotel has an outdoor swimming pool, a temperature controlled indoor pool and a terrace. There is a fully equipped gym for those who wish to stay active. There is a lovely spa with steam room offering massages and therapies. Tiny tots can have fun at Kid’s Club or Playground. There is a tour desk and ticketing services. Public parking is possible on site (reservation is not possible) and charges may be applicable.